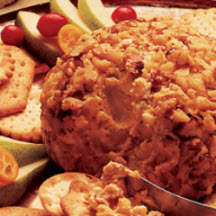 Cream cheese, sharp cheddar cheese spread, blue cheese and a dash of celery and onion salt are combined to make this tasty cheese ball rolled in chopped walnuts. Serve with crackers or vegetables. In a small bowl, beat the cream cheese until softened and blended. Gradually stir in the cheese spread; mix well. Stir in the blue cheese, celery, and onion salt. Form into a ball. Roll in the chopped walnuts. Chill until firm.